of creating the installation. The system offers structures to be opened on the facade: parallel windows (MC PW) and roof windows (MC RW). 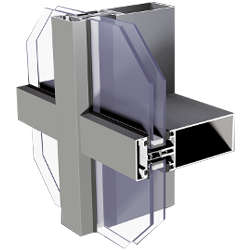 The curtain wall in the MC Wall system consists of mullions and transoms fastened by stainless steel bolts. There are 2 x ø 6 stainless steel fasteners per joint; the fasteners ensure very high load capacity of the mullion-transom connection, both in the wind pressure plane and the infill load plane. The solution does not prevent using traditional transom brackets or fastening transoms only with screws attached from the face side. An important place in our façade systems is occupied by the mullion-transom wall MB MB-SR50N. It has enhanced thermal insulation variants: MB-SR50N HI and MB-SR50N HI+, as well as variants for fabricating constructions of different appearances: vertical or horizontal line or “semi-structural” facade MB-SR50N EFEKT. When it comes to openable elements, the MB-SR50N is the basis for constructions such as tilt-and-pull windows MB-SR50N OW, façade-integrated windows MB-SR50N IW, and, very aesthetic and functional roof windows MB-SR50N RW. 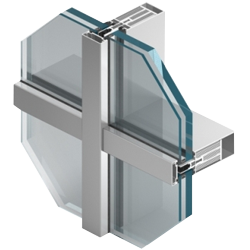 The MB-SR50N mullion-transom system is also a basis for fire resisting façades MB-SR50N EI and glazed roofs. The MB-SR50N-based roof constructions and façades can optionally be fabricated in a fire-resistant variant.